Cybotron were a pioneering and influential American electro music group formed in 1980 by Juan Atkins and Richard "3070" Davis in Detroit. Guitarist John "Jon 5" Housely joined soon afterward. 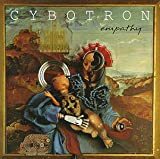 Cybotron had a number of singles now considered classics of the electro genre, particularly "Clear" and the group's debut, "Alleys Of Your Mind," as well as "Cosmic Cars" and "R-9".